Crack injection has many advantages over other methods. For example, if you’re sealing a leak in a water tank, you can inject from the outside of the tank. So the tank can remain in service while you repair it. Having to dry a crack, like you do with epoxy resin, is not needed as this material reacts with water. The material also remains flexible at all times. 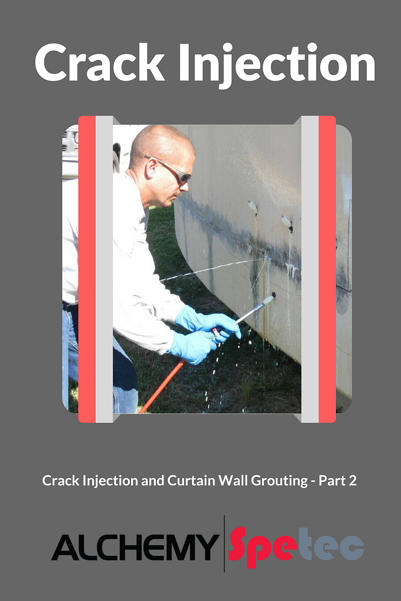 Crack injections can be applied in both vertical cracks and in horizontal cracks. With vertical cracks, it is imperative to start at the bottom of the crack and work your way up the crack until it is filled. This forces the material up and through the crack and will simultaneously push the water up and out as well. With horizontal cracks, injection can be started at either the left or right end. Step 1. Identify crack locations. Step 6. Insert injection ports on both sides of crack. Step 7. Inject water into each port. Step 3. Prepare surface of crack. Step 8. Start injection of material. Step 4. Drill injection holes at a 45 degree angle. Step 5. Flush out all injection holes with water. Customers who joined us in the Alchemy Polymers era may not be familiar with the acrylate grouts we’re now offering after the merger with with Resiplast US. Acrylates offer a very wide range of set time control, which makes them good for everything from very tight cracks to gushing leaks (not to mention soil stabilization). One thing to be aware of: all wetted metal equipment parts that acrylates come into contact with must be stainless steel. Want more information on leak seal technologies?